Property 4: Mountain House Getaway! Property 6: Beautifully furnished mountain house! Property 7: Couples getaway retreat! Property 11: Glen Onoko Guesthouse ~ Renovated Mercantile Building ~ with on site Parking! Property 12: Centrally Located To All The Best The Poconos Has To Offer! Property 17: Big Boulder townhouse, free Wi/Fi, central A/C, Cable, Skiing, Mountain views! Property 26: 2BR Townhome - Jack Frost Mountain in Poconos - All Seasons! Property 32: Poconos Home w/ Deck & BBQ - Lake & Pool Access! Jack Frost Mountain Rental!! Close to slopes!! Property 34: Jack Frost Mountain Rental!! Close to slopes!! Property 35: Lake Harmony Townhome - 2 Mins To Big Boulder Ski! 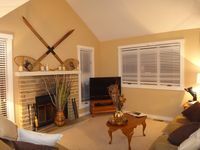 Beautiful Townhome Rental For Your Mountain Getaway! Walk To Jack Frost Slopes! Property 38: Beautiful Townhome Rental For Your Mountain Getaway! Walk To Jack Frost Slopes! RENOVATED TOWNHOUSE ... NEAR EVERYTHING! Property 43: RENOVATED TOWNHOUSE ... NEAR EVERYTHING! Lake Harmony Townhome w/ Deck, Grill & Hot Tub! Property 44: Lake Harmony Townhome w/ Deck, Grill & Hot Tub! Property 45: Beautiful & Clean 5 Bdrm Town House! 2 Minutes Away from Skiing at Big Boulder! Park Your Car & Enjoy! Property 46: Park Your Car & Enjoy!